Landlords in Belfast who own shared homes such as student accommodation are facing tough new laws. From 1 April, houses in multiple occupation (HMOs) will need to have a licence issued by Belfast City Council. The main aim is to protect the health and safety of tenants, who will be able to check online if their home is licensed properly. Licences can be removed or revoked for several reasons and councils can impose specific conditions. They can also refuse to issue a new licence if the landlord is not deemed fit or if there is already over-provision of HMOs in the area. There are almost 4,000 HMO landlords in Northern Ireland, who rent more than 6,600 shared properties to tenants - 4,360 of those are in Belfast. Councillor Charlene O'Hara, the chairwoman of Belfast City Council's licensing committee, said: "Some parts of Belfast have high concentrations of shared accommodation and council welcomes the additional powers this legislation brings to help regulate this sector." She added that the council was supportive of the extra assurances the regulations provide to residents, tenants and neighbouring properties. The area with the highest concentration of HMOs in Northern Ireland is the Holylands in south Belfast, which lies to the rear of Queen's University and is home to much of the city's large student population. The Holylands has developed an unfortunate reputation for drunkenness and violence over the St Patrick's Day holiday celebrations. Brid Ruddy, of College Park Avenue Residents' Association, a long-time campaigner against anti-social behaviour in the area, gave the new HMO regulations a cautious welcome. She said the old legislation "had so many holes it was like a colander". "Going on past experience I wouldn't be overly optimistic," she added. 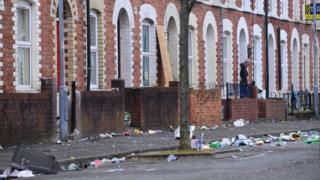 Stormont's Department for Communities said the primary purpose of the new licensing system was to improve housing conditions for tenants but there was a wider concern for the behaviour of occupiers. "It also impacts on issues that can affect neighbourhoods as a whole," said the department. "So, while landlords are not responsible for their tenant's actions this can support more active engagement in terms of enforcing tenancy conditions if problems arise. "This can include issues of noise or rubbish arising from licensed HMOs." The Landlords' Association for Northern Ireland is advising property owners to keep themselves informed of the new requirements. "As the provisions of the HMO Act have not yet been implemented and will need time to settle in we think it is too early to comment on the scheme at this stage," it said. The changes have been given a cautious welcome by Housing Rights, the housing advice group. Laura McNamee from Housing Rights the said the changes should go a long way towards protecting the safety of tenants. "We would welcome the option for the councils to issue conditions to bring properties up to standard," she said. She added that there were concerns that the imposition of conditions could result in a risk of occupants being made homeless. What are people's experiences of living in a shared home?